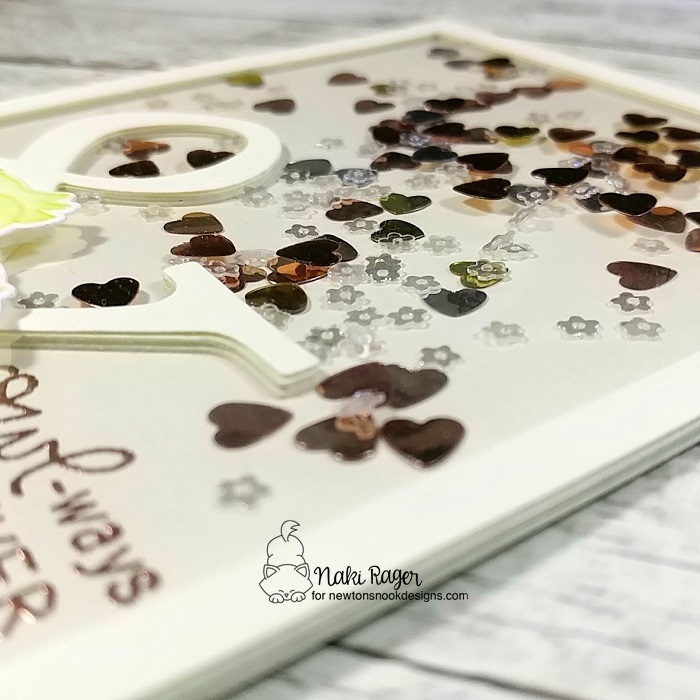 Welcome to day 3 of the Newton's Nook Designs January Release! All the new products will be available for purchase this Friday the 18th in the Newton's Nook Designs Shop! Aren't these owls absolutely adorable!? 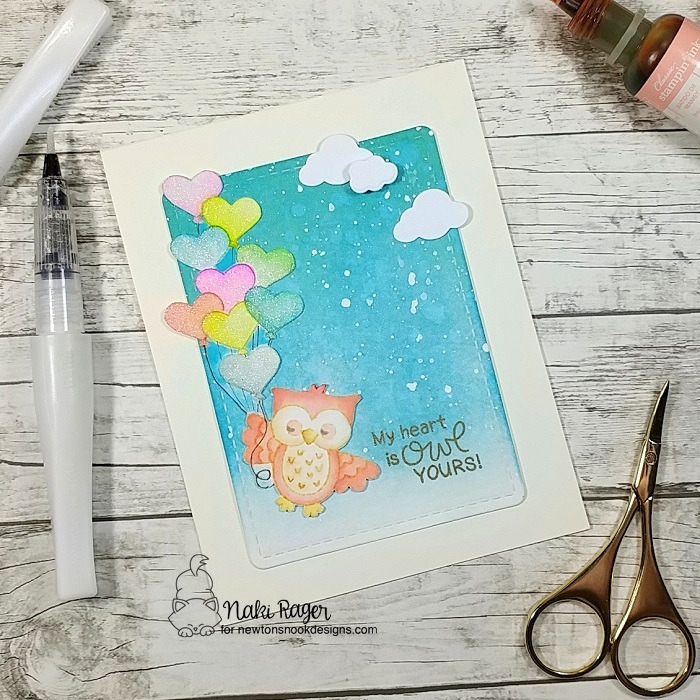 First I stamped, watercolored, and fussy cut this cute little owl with a single balloon image. And then I stamped the same image again, then a whole bunch of balloon. I watercolored all the balloons, fussy cut it, and paper pieced the owl with a single balloon image on top to just a bit of dimension. The stitched panel was die cut using the Frames & Flags Die Set from watercolor paper. I blended a few shades of blue Distress ink and splattered lots of water and white ink. I borrowed the little clouds from the Newton Scoots By Die Set and popped them on. I tend to always pick soft colors but this image was colored extra light with Tattered Rose and Twisted Citron Distress Ink. Aren't they so, so, so sweet!? The cute sentiment was heat embossed with copper EP on the base card before I started to build my shaker. Because this cover die has this big ampersand, I decided to die cut several of them and pile them up instead of using the foam tape. The Acetate Sheet was added right before mounting the last piece. We have one more reveal day and you really won't want to miss tomorrow!!! Such a beautiful background on both and amazing soft coloring! Love those cards, thanks for sharing your talent with us! These are so amazing! I love the big stack of balloons on the first one! And the added sparkle is so pretty! And the shaker card is super cute too! The little pink and green owls are the best! WOW! What an amazing pair of cards! Such creativity! Can't wait to see all your creations this year! Love your no-line coloring! These owls are just adorable! Awesome cards! Love the soft colors on both and the creative shaker design. 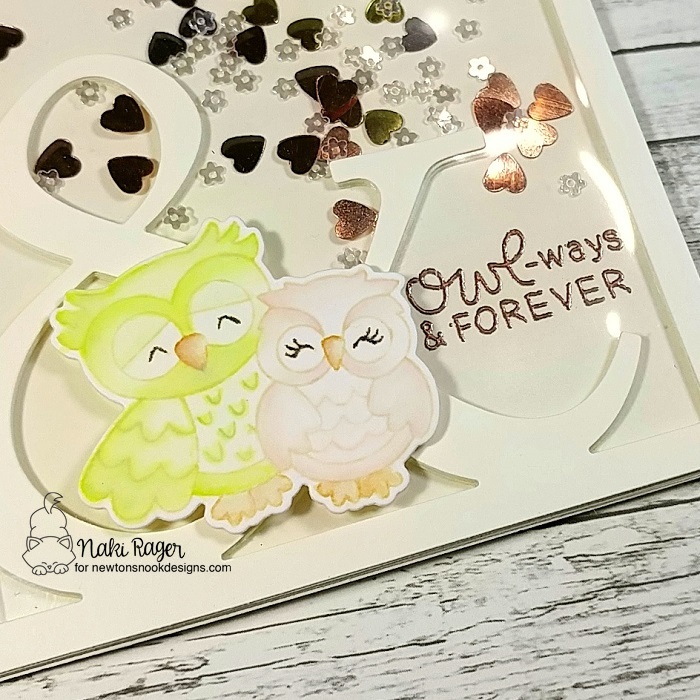 A standing owl-vation for your two darling cards! Love the shaker and the fab background for the owl with so many balloons! 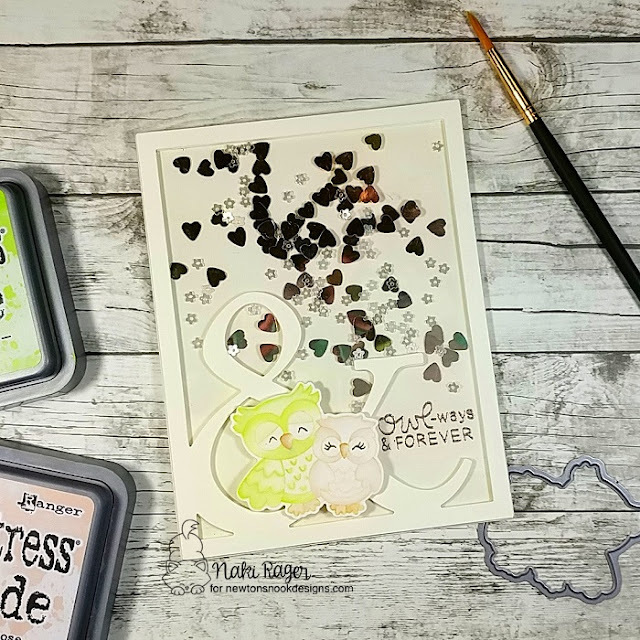 so adorable owl stamp set! I love the dimension on your cards. Both are really sweet and oh so cute. 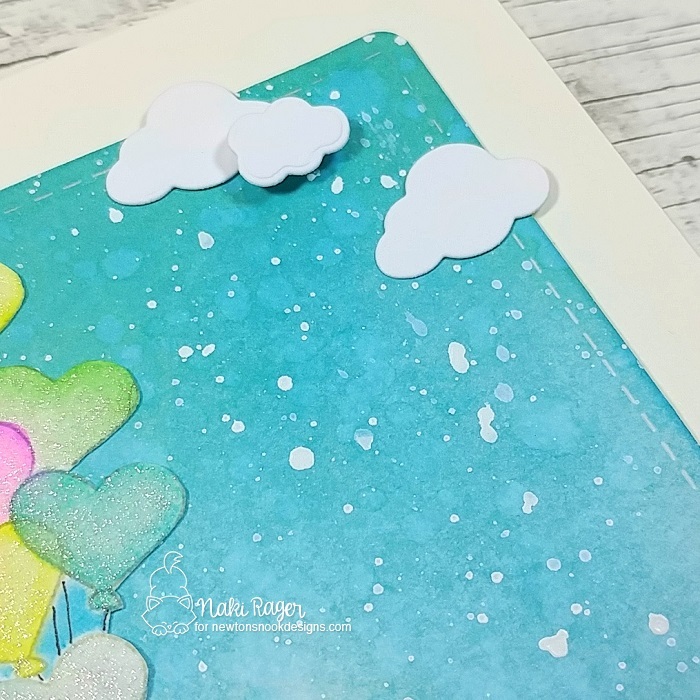 The shaker card is great and the heart balloons is a great touch to the first card! I love your heart-balloon bouquet and the soft colors. Very cute cards. I love the translucent balloons on the first card. Love the soft pretty colors you used on these cards! 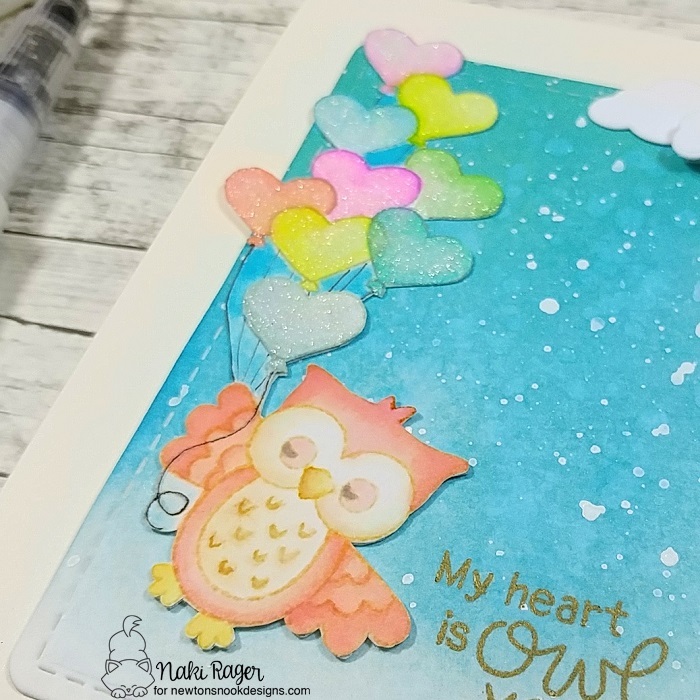 The owl with the heart balloons is so cute! Your shaker card is beautiful! These owls are so adorable! OMGosh Beautiful cards!! Lovin' the stamps!! Wow - both cards are so awesome! Love that shaker card!! Beautiful! :) Love the pretty colors. 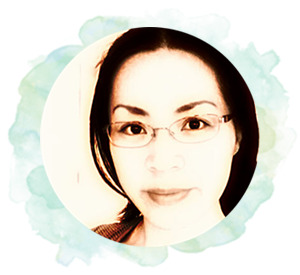 Love your blog and sweet projects! Great design and wonderful coloring. Love the no line coloring and non-traditional owl colors. How fun!! Love how you used watercolor on your cards. So cute. What a great combination of owls and balloons. Wonderful cards. I love the colors of your owls. Your owl cards are super adorable! I love them both!! Love your fun shaker card.